From left to right: Michele Clark, Kansas Healthcare Collaborative, Melanie Urban, RN, BSN, NACP, Patient Quality Services Director at HaysMed and Paul Carrington, RN, CNO, Pawnee Valley Community Hospital discuss HEN at a recent meeting at HaysMed. 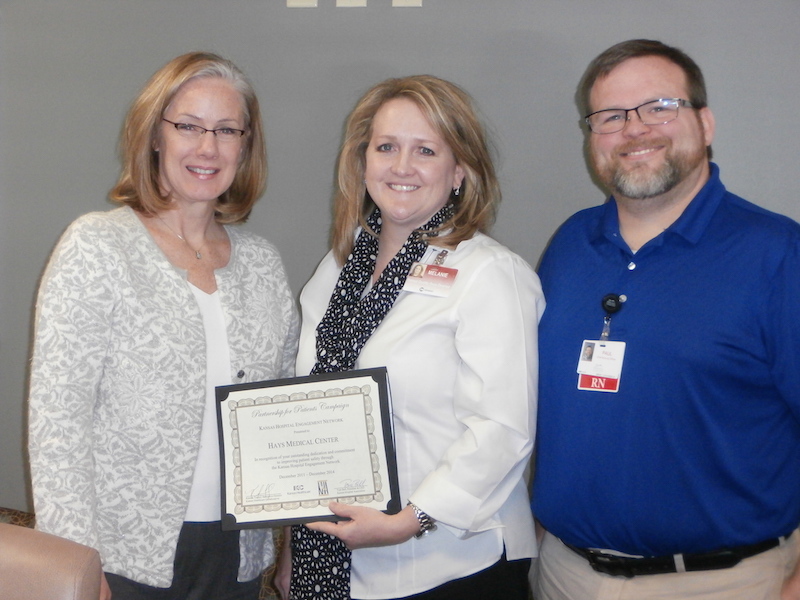 HAYS, Kan. (Jan 20, 2015) HaysMed, Hays, has been recognized by the Kansas Healthcare Collaborative (KHC) and the Kansas Hospital Association (KHA) for its participation in a three-year national Partnership for Patients initiative known as the Hospital Engagement Network (HEN). HaysMed and 99 other hospitals in the Kansas HEN collectively prevented an estimated 3,800 safety events (including readmissions) at an estimated cost savings of more than $23.2 million, as calculated by the Health Educational Research Trust (HRET). HHS reported that national efforts to improve patient safety resulted in an estimated 1.3 million fewer patient safety events, 50,000 lives saved and $12 billion in health spending avoided. “Our health care team is devoted to safe, high quality care delivery,” said Dr. Larry Watts, Chief Medical Officer. “We are proud of our collaboration with our peers across the state, our patients, and the impact our work has made to improve patient safety. We appreciate the physicians, nurses and other key staff who contributed to this successful initiative.” Watts said. The statewide collaborative, led by the Kansas Healthcare Collaborative, allowed hospitals to learn from state and national subject matter experts, plus work together to share best practices and resources to rapidly achieve progress in technical and cultural aspects of patient safety. For more information about HaysMed and our patient safety initiatives, please contact Melanie Urban, Director Patient Quality Services at 785.623.5590.. For more information about the Kansas HEN, visit www.khconline.org.